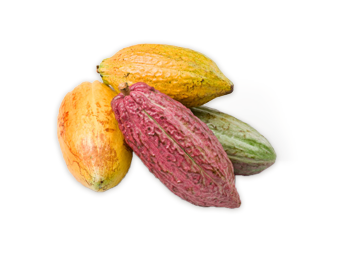 (Theobroma cacao) Cacao beans – also known as seeds - are fermented to develop their flavor and color, dried, roasted and ground into a paste. The cacao butter is removed from the paste, leaving the dry unsweetened cocoa powder, then remixed with a portion of the solids and sweeteners to create chocolate. Cocoa is a good source of essential minerals including iron, manganese, magnesium and zinc as well as Vitamins A, B1, B2, B3, C, E, and pantothenic acid. It contains several compounds which stimulate the production of dopamine in the body and potent mood enhancers, encouraging an overall sense of wellbeing. After processing into Cocoa, it retains some flavonoid compounds which may be beneficial to heart health and help maintain healthy cholesterol levels. In cocoa, flavonoids function as antioxidants and help to reduce inflammation.